TL; DR; If your source code is written in Go and it uses one-way or mutual TLS authentication, you are vulnerable to CPU denial of service (DoS) attacks. The attacker can formulate inputs in a way that makes the verification algorithm in Go’s crypto/x509 standard library hog all available CPU resources as it tries to verify the TLS certificate chain the client has provided. To protect your services, upgrade immediately to Go v1.10.6 or later, or v1.11.3 or later. The backend of the API Security platform by 42Crunch has been implemented using a microservices architecture, with the microservices written in Go. The microservices communicate with each other over gRPC and have a REST API gateway for external invocations. To ensure security, we follow the “TLS everywhere” mantra, extensively relying on the mutual TLS authentication. Go provides native SSL/TLS support in its standard library, as well as an extensive set of x509 and TLS primitives for manipulating connections, verifications, authentication, certificates, and so forth. This native support avoids external dependencies and reduces the risks by using a standard vetted and maintained TLS implementation. It naturally follows that 42Crunch could potentially be affected, was curious about this TLS vulnerability and had to understand it to ensure the security of the 42Crunch platform. The following analysis and details on this CVE are provided by the 42Crunch security team. “Package crypto/x509 parses and validates X.509-encoded keys and certificates. It’s supposed to handle certificate chains provided by an attacker with reasonable resource use. The issue lies along the call path crypto/x509 Certificate.Verify() function, which is responsible for authenticating and verifying certificates. 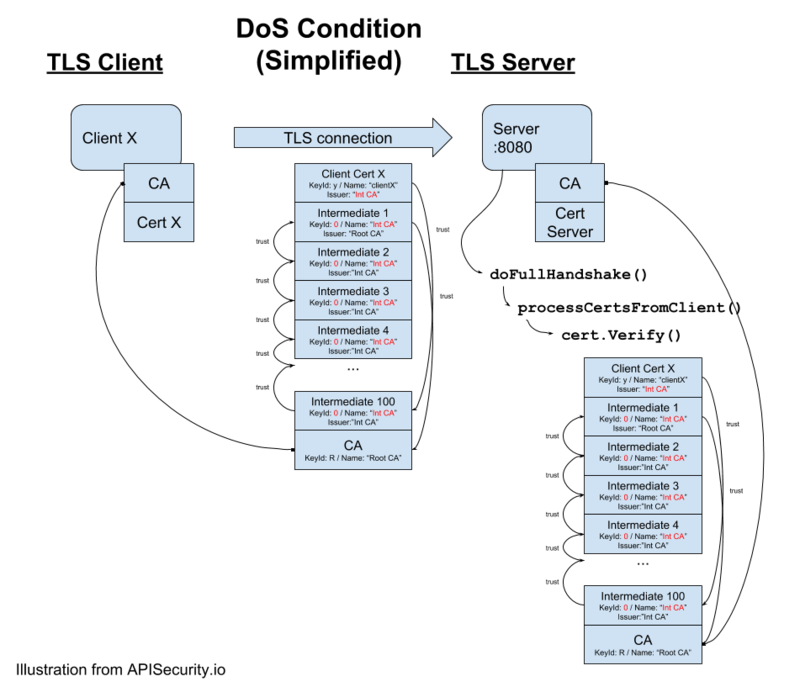 To simplify and stay concise, we explain only an example where a TLS client connects to a TLS server verifying the client certificate. To understand what went wrong, you need to understand how certificate pools are organised to allow certificate verification in an efficient manner. A certificate pool, simply put, is a list of certificates, that are accessible through three different ways depending on the need. 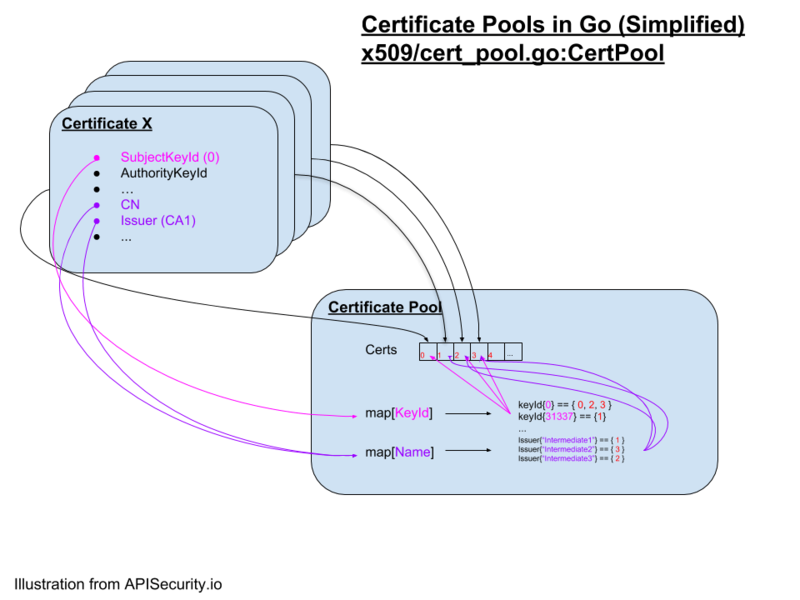 The following diagram shows an example of this: Certificates grouped in a pool are accessible through an indexed array (named “Certs”) and are hashed by CN, IssuerName, SubjectKeyId. The server calls the function Verify() with VerifyOptions on the client certificate (the first certificate in the chain:certs). The buildChains() function in turn calls some CPU-expensive functions sequentially and recursively calls itself on each element of the chain it finds. 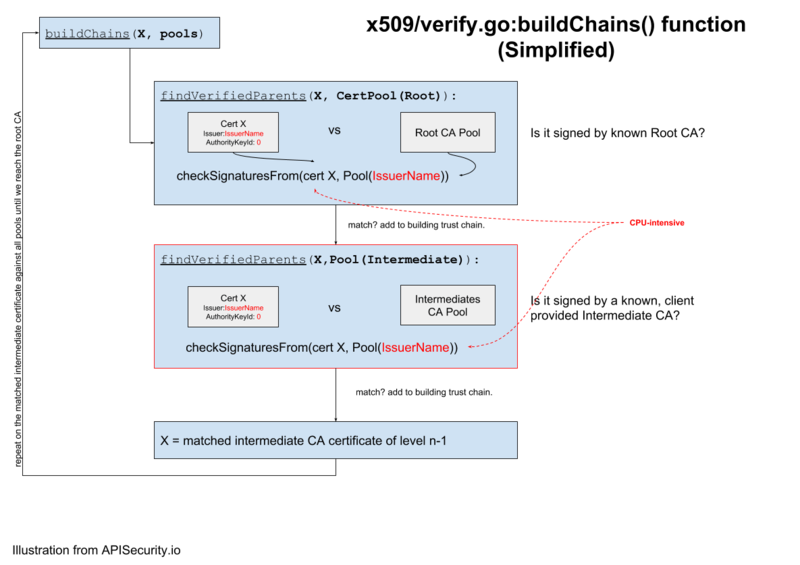 The buildChains() function relied on a helper function findVerifiedParents() that identifies the parent certificate, using map access of the certificate pool by IssuerName or AuthorityKeyId, and returns the index of the certificate candidate that then gets verified against the client controlled pool. The main CPU DoS is triggered by buildChains() and findVerifiedParent() functions in the unexpected conditions where all intermediate CA certificates share the same name and have a nil AuthKeyId value. The findVerifiedParent() function returns all certificates matching that name, which is the entire pool, and then checks signatures against all the certificates. Once that is done, the buildchains() function is again called for the found parent recursively until it reaches the root CA, each time verifying against the entire intermediate CA pool ,and hence consuming all available CPU for only one TLS connection! 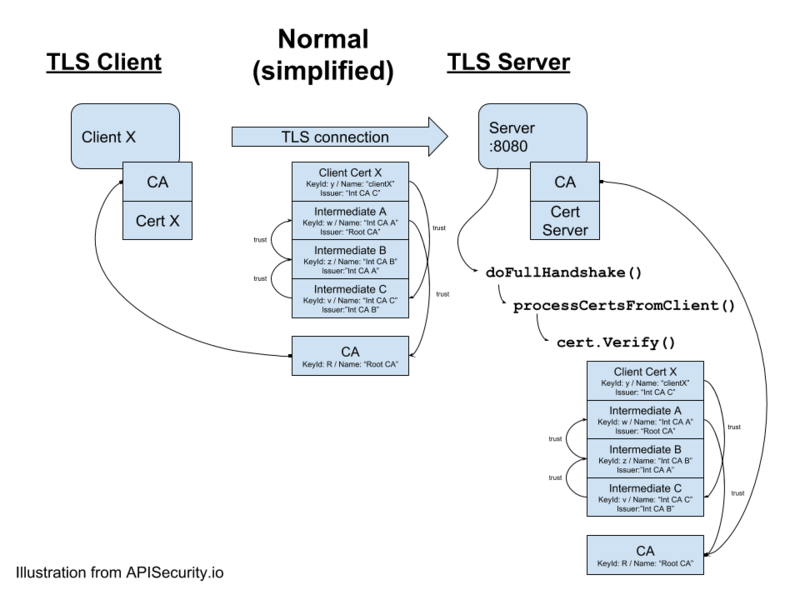 An attacker can construct a certificate chain that makes the client certificate verification consume all the CPU resources and thus making the host less responsive. This has been implemented with only one connection. In accordance with Go scheduler rules, only two CPU cores were affected and used at 100%, creating a new connection and forcing the scheduler to allocate more resources to process the signature check, which in turn can lead to an unresponsive service or host. To get the fixes, upgrade immediately to Go v1.10.6 or later, or v1.11.3 or later.